List of hosted, planned, and spoken–at events. Invited by the Northern California Carpenters Regional Council to tour the International Training Center in Las Vegas, Nevada on November 15–16, 2018. Travel group included elected officials and city bureaucrats, higher education administrators, nonprofit directors, and career development executives. Following up our meet-and-greet during the campaign, we held a post-election decompression event to congratulate Janice Li on her election, discuss plans for 2019, and pat fellow urbanists on the back for a job well done in November 2018. On Oct 28, 2018, YIMBY Mobility teamed up with State Senator Scott Wiener’s office and the SF Bike Coalition to advocate against Proposition 6, which would repeal a recent increase in the state's gas tax and vehicle fee. The "Hair and Heels" bike ride was organized in response to comments from California congressional candidate Diane Harkey. Harkey said that if Proposition 6 didn't pass, people would be forced to bike and take trains, and that wouldn't work for her because of her "hair and heels." During the 2018 midterms, YIMBY Mobility successfully helped elect Janice Li to BART Board and defeated Prop 6, the effort to repeal CA’s newly enacted gas tax (#NoOn6), by phone-banking and canvassing San Francisco’s West Side (D1, D4, and D7) and its northern Marina District (D2). 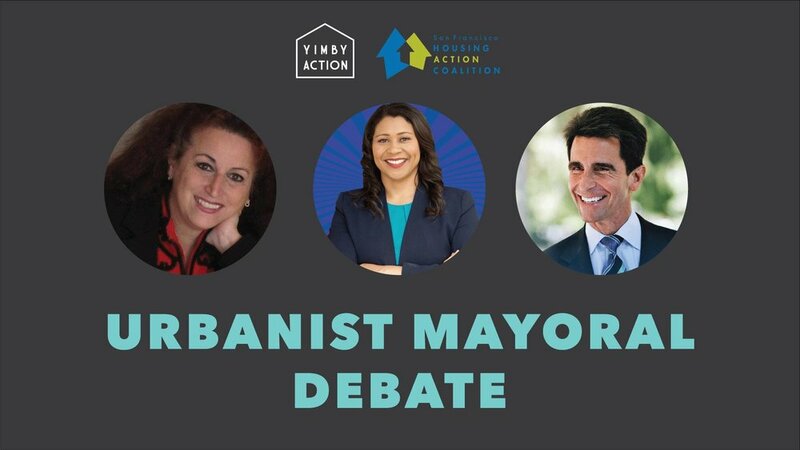 YIMBY Mobility was founded to activate the YIMBY movement’s growing energy around transportation issues. In addition to campaign-related efforts, we hosted monthly general meetings in August, September, October, and November to introduce members to current citywide and regional mobility organizations and communicate priorities to volunteers. Hosted the first debate of the 2018 district 10 supervisor’s election, featuring Neo Veavea of Visitacion Valley, Shamann Walton of Bayview–Hunter’s Point, Theo Ellington of Bayview–Hunter’s Point, and Tony Kelly of Potrero Hill. The debate was moderated by Hoodline writer and Bayview native, Meaghan Mitchell. After the debate, D10U endorsed Theo Ellington (#1) and Shamann Walton (#2). Walton won in November 2018. Approached by JUMP Bikes to plan a presentation in Bayview-Hunters Point to collect service feedback of its existing fleet and learn about its expansion plans in 2019. We partnered with newly opened local business, Cafe Envy, and kicked a series of sister events around the city due to events success. The event was in September 2018.
organizer | Future of SF Urbanism: Housing, Transit, and PDR?! Moderated by Bayview local Meaghan Mitchell of Hoodline, this panel continued the dynamic discussion of growth in District 10, the urban future of San Francisco. How do our local businesses make it happen day-to-day? What struggles do they face in getting the job done (or getting to their jobs)? What efforts are at play in Bayview and District 10 to support community amidst the growing number of neighbors? I started D10 Urbanists in early 2018 because I saw the need for greater interconnectivity between the neighborhoods of San Francisco’s District 10. In 2018, D10U organized monthly member events, happy hours, and community events. The organization endorsed candidates in both the June and November 2018 elections. The Cannabis Education Advocacy Symposium and Expo (CEASE) is a 501c3 nonprofit organization with a mission to increase awareness and to educate consumers about the medical and economical benefits of cannabis as a legalized product. CEASE Oklahoma City took place from February 22–24, 2018. This addressed the important history of the industry while providing updates on diversity opportunities in cannabis business, education, and advocacy. Panelists also gave thoughts on key collaborative next steps required to achieve the desired representation of people of color within the cannabis industry. Panelists: Virgil Grant III, California Minority Alliance | Fanny Guzman, Latinos for Cannabis | Lakisha Jenkins, Foundation of Natural Health | Rosalind McCarthy, Minorities for Medical Marijuana, Inc.
Reboot Safety partnered with FUSION on November 5, 2016 to host Reboot Safety: Oakland, the East Bay's first hackathon against police and community violence.What is a “hackathon”? A hackathon in essence, is an event that brings together diverse experts and perspectives from across multiple sectors to problem solve creatively. Bringing together a dynamic group of culture sector leaders, policy makers, researchers, artists and creatives to solve the issues related to public safety. What's a Hackathon? A hackathon in essence, is an event that brings together diverse experts and perspectives from across multiple sectors to problem solve creatively. How can technology be used to combat systemic violence in our communities? As the 2014–2015 class of Literacy is the Edge (LITE), we created repeatable events for the Literacy Council of West Alabama (LCWA). Among those events was “Light Up the Game,” an activation before and during college athletics – primarily college football – to increase awareness about LCWA’s effort to eradicate adulthood illiteracy. The University of Alabama Dance Marathon fundraises all year to support the Children’s Miracle Network and Children’s of Alabama. The year culminates in the dance marathon, the end-of-year celebration where students and families gather to dance for 12+ hours. Its first year raised $15,000 and this number grew to $56,000 in 2013. In 2014, UADM raised $83,061.09. Alabama Model United Nations Conference (ALMUN) is an annual weekend-long conference hosted by the Alabama International Relations Club. Based on simulations of United Nations committees and debate, it encourages the creation of new Model United Nations programs in schools across the state of Alabama and the wider region. In its first 10 years, ALMUN has hosted schools from Alabama, Tennessee, Louisiana, and Florida. The crisis committee format was introduced in 2013 and, since then, ALMUN’s reputation has been defined by its well–developed and unique committee offerings.